Welcome to the Reading With Your Kids Podcast, iTunes number 1 Kids & Family Podcast! Please join us and Kyle Bagsby , author of the newly released delightful middle-grade book Autumn Eternal on the Reading with Your Kids podcast. Autumn Eternal is a first book in the Fantastical Stories Told Beneath the Willow Tree series, which includes a collection of stand alone middle grade fantasy books. Each book can be read separately, but they form a bigger story when read together. In Autumn Eternal, we meet Kip Carringer who is determined to uncover the secrets within his town with the help of his best friend Marleigh Belle. Along, the way they run into some trouble, and end up having to more or less save the world from certain doom. We loved everything about Kyle’s beautifully written and fun book for the middle graders, and we’re sure you will LOVE it too! 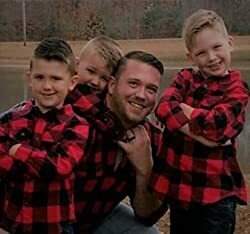 Kyle Bagsby lives in middle Tennessee with his wife and three boys. He studied elementary education and criminal justice at Tennessee State University in Nashville. Kyle writes middle-grade fantasy and coaches youth baseball. Of all the places to grow up, Kip Carringer spent his youth in the secluded little town of Arno. Strange things were common there but no one seemed to notice, except for Kip that is. There was a witch living in the woods and all year long it was Autumn. And as if that’s not strange enough, all the birds around the town and through the woods mooed like cows, instead of chirping or squawking like birds are supposed to do. Kip was determined to uncover the secrets of the town, all while trying to convince his best friend Marleigh that he wasn’t crazy. However, unknown to Kip, the adventure was waiting for him just around the corner. An adventure that would be filled with pie stealing creatures and a dark, dark looming shadow. Click the Amazon link below to grab your copy of Autumn Eternal and let the Adventure get started! What is Autumn Eternal all about? Where did Kyle get the idea from? If he always wanted to be an author? How is Kyle feeling about the release of his debut middle grade book? Where did Kyle find the time and dedication to write this story? Some of the interesting facts about his book, exclusive sneak peek into his next book and much more. Be sure to tune in to catch all the fun! Kyle, you rule. Thanks for doing this interview, best of luck with Autumn Eternal! For more from Kyle, like his Facebook page. We’d LOVE to hear what you think about the podcast and any suggestions on what you’d like to hear in future episodes. Feel free to connect with us on our social media, or email us anytime by contacting us. PreviouslyAttention Please, Principle Mikey Is Here! !